About 2 months ago I discovered we had an ice cream machine. I have no idea how long we’ve had it. It was brand new in the box, in the back of a closet. Must have been one of those random appliance purchases that got filed away. Well it’s now my favorite piece of equipment. Yesterday I made homemade blackberry sorbet and the day before I made peach. Both fruits are in abundance at our local farms now. Prior to my new sorbet making addiction, I would have thought that making any form of ice cream was very labor intensive and not worth the effort. Wow, was I wrong! As the summer has moved along, I’ve made the different seasonal fruit sorbets. Strawberry, mango, peach and here is the blackberry. Delicious and only 4 ingredients. 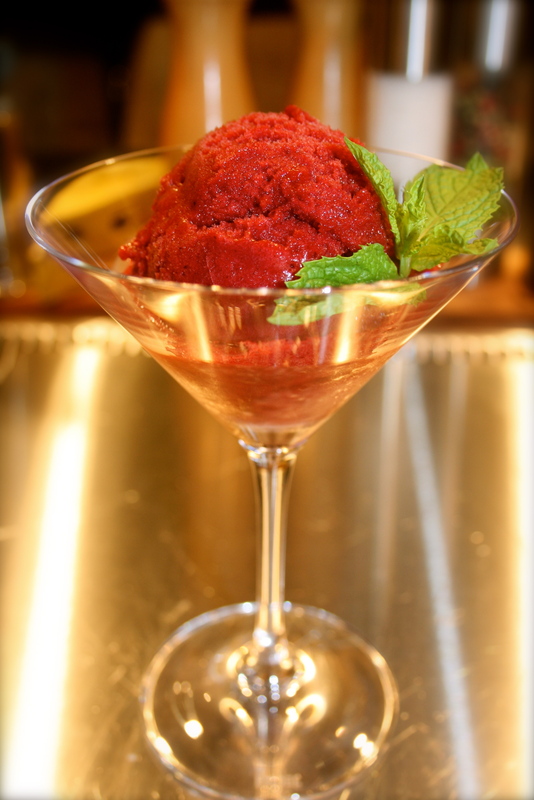 By the way, this is one of the more complicated of the sorbets I have made because you have to strain out the seeds. Make a simple syrup by combining the sugar and water in a small saucepan. Bring it to a boil and stir until the sugar is completely dissolved. Shut off the heat and let it cool down. Place in the refrigerator until it completely chilled. I usually make my simple syrup the day before I make the sorbet – then I know it’s nice and cold. If it’s not, your sorbet won’t work. 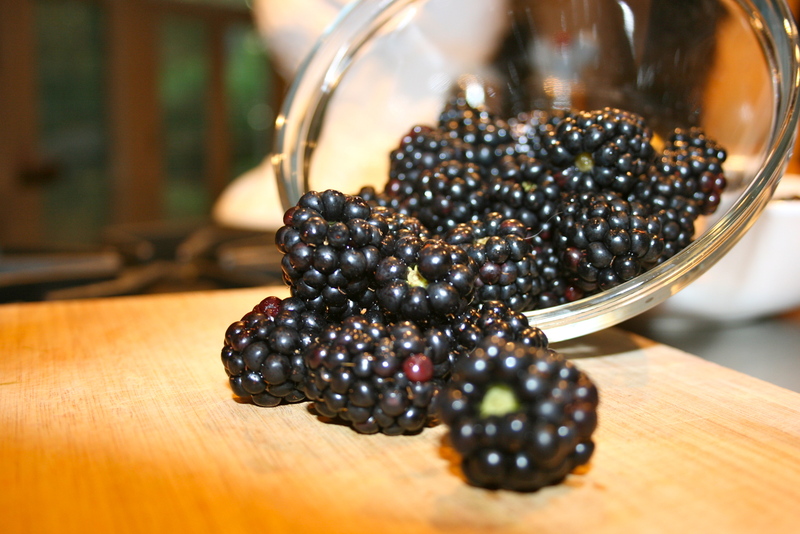 In a food processor, add half the blackberries and half the simple syrup. Process until smooth. Pour the mixture into a mesh strainer, over a large bowl and move it around using a rubber spatula to push the liquid through while the seeds stay in the strainer. Repeat with the remaining berries and syrup. Be sure to scrape the underside of the strainer to get every last bit of the liquid. Stir in the lemon juice. If you chilled your simple syrup overnight you can move on to your ice cream maker now. If you’re uncertain if it’s cold enough, stick the mixture in the refrigerator for a few hours to be sure. Next just pour the mixture into the machine and let it do it’s magic. I have the Cuisinart machine and it takes about 30 minutes. You’ll know it’s done when it’s the consistency of soft ice cream. Place it in a container (I use those 32oz plastic deli containers) and put it in the freezer to set for a few hours. Then lick the bowl and spatula. You wouldn’t want to waste any of it. YUM! IMPORTANT TIP: the first time I used our machine I was very impatient and didn’t let the freezer bowl of the machine freeze for long enough. It says that it will take 6-22 hours depending on your freezer. That’s a really big range of time, isn’t it? Weird. Anyway, I only froze it for 8 hours or so. It wasn’t long enough. Now I keep it in my freezer all the time, so it’s ready when I need it. I would recommend keeping it in there overnight before you use it the first time.